I’m kicking off the week with a ‘Day to Night’ styling outfit post. I showed you this black and white tartan skirt from Penneys/Primark in my December haul video and it proved pretty popular. The skirt has quite quickly become a staple piece in my wardrobe. As it’s such a versatile item of clothing I’ve styled it in two different looks which you can read more about below, just “Click to View Post” under the image. I really wrapped up for this look, didn’t I?! In my defence it’s been so cold and windy outside that I had no choice. I layered a few different items from my Winter wardrobe so that overall it was a practical outfit that was still stylish. I admit, I was most looking forward to sharing my new handbag with you in an outfit post! This was a Christmas present I received, isn’t Santa a great man! I absolutely love it and the mint/grey hues are perfect for this time of year. I also love that it has a detachable long strap so that it can be worn over the shoulder, which is how I prefer to wear my handbags in general. This oversized cardigan made quite a few appearances in my Winter wardrobe but this is your first time seeing it in an outfit post. I like to add some shape to oversized clothing such as this by adding a simple belt or ribbon to the waist. Cut-out detail ankle boots were a must-have item for Winter and I had a lot of fun adding cute and colourful socks under these boots. That’s basically my favourite aspect of wearing cut-out detail shoes and boots. You might remember these boots from my November haul video, if you haven’t seen it yet check it out here and view the boots in more detail. Bec Boop loves to party but I don’t often get the opportunity to share the outfits with you here on the blog as I’m usually always in such a rush to get ready for nights out. 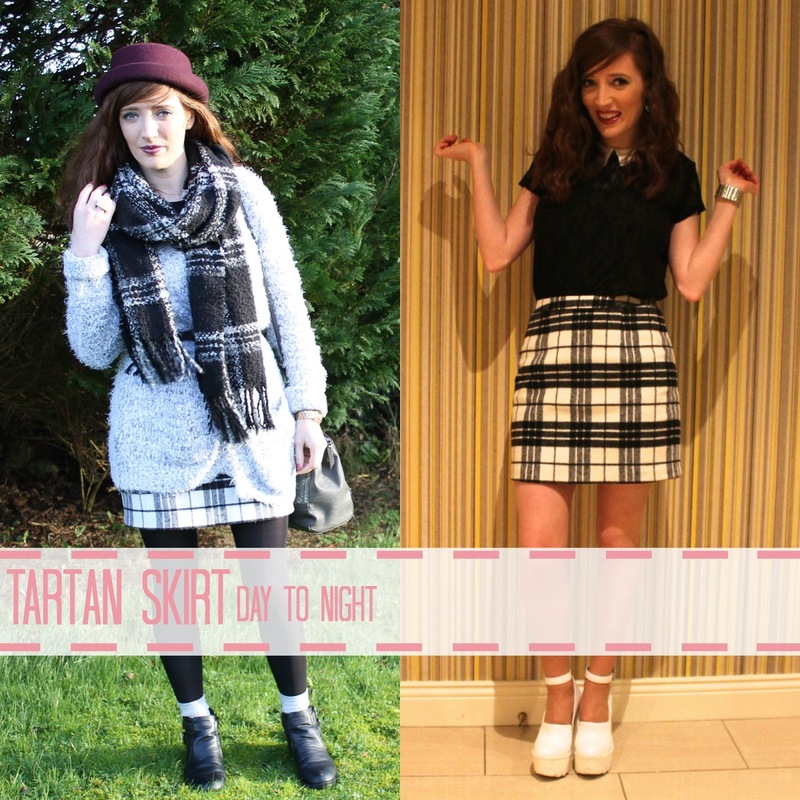 I made time on Saturday night though to set up my little tripod and take a few outfit shots so that I could show you how I styled this tartan skirt for a night-time/evening look. I kept the whole look monochrome and just added some colour with the Maybelline Colorsensational Lipstick in Midnight Plum. I’ve really had a thing for cute collar detail lately on t-shirts and I absolutely love this t-shirt. It has everything I could want in a simple tee – monochrome, cute collar and lace fabric. Perfect! I added a simple black shoulder bag and my massive white cleated River Island shoes. I honestly feel like a giant when I wear these, it’s a nice feeling for someone who is usually looking up at the world *short girl problems* and they are so surprisingly comfortable to wear. The large platform at the front ensures that they are really easy to walk in so – comfort and height; it’s a win win situation. I’d love to hear from you in the comments below, do you have any items of clothing that you can style for both a day and a night look? Which of these looks is your favourite? "black and white tartan skirt from Penneys" it is both touching & comforting 2 c a non-snobbish fashionista that comes up w/ a nice outfit from the most unexpected (4 judgmentals) albeit most accessible (4 ordinary people) source. I'm currently a rhapsody in (dark, navy, cobalt, cerulean, ultramarine) blue 4 both day & night. I hope 2 xtend this as soon as I can af4d entering MacOcagain as a customer myself. My fav look above is the topmost "Daytime Outfit" (right below the title) pic. What a cute outfit! You pulled it off effortlessly! I like the day look better just because I love layered looks, but the night look looks just as good. (-: I don't go out much so my looks are pretty casual. Lovely post! Thanks Jessica! Yeah with tops and skirts it's easier to transition. I find it a bit harder when it comes to dresses.